One of your many questions might have to do with what the difference is between regular soil and topsoil. Hello, Phoenix homeowners. With the days starting to grow longer and the sun setting later, it’s time to start spending more time outside. Although we’re still several months away from spring, the time is right to start thinking about the condition of your soil. One of your many questions might have to do with what the difference is between regular soil and topsoil. Luckily, we have answers for you. Soil generally has minerals in it. There will also be some organic matter mixed into it, too. What that matter is made of depends on the type of soil you have. It can contain clay, silt, or sand. There’s also water, air, and tiny little organisms that you can’t see but help the earth become more nutritious and oxygenated, allowing plants to grow in your Phoenix garden. Topsoil is a bit different than normal soil. It includes fertilizer, rice, wood, and clay. Sand and silt are also present in topsoil. Topsoil needs organic material in it because without it there won’t be air, moisture, or nutrients. If you use the right topsoil, you can make low-quality garden soil even better. You’ll also find sand, clay, silt, and loam in your garden soil. Depending on what it’s made of, you may want to order as much topsoil as possible now before the constant rush in March and April. 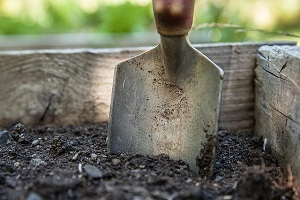 Before you can use any soil at all, you should inspect it. If there are rocks in the soil, they shouldn’t be more than three inches wide. Rocky soil can affect what you grow in it. Make sure that both your soil and topsoil isn’t loaded down with organic filler, which at first might seem to make it more effective, but won’t. Combine your topsoil with your regular mix to see how well they blend. This entry was posted on Friday, January 18th, 2019 at 12:02 pm. Both comments and pings are currently closed.